The Sacramento Kings and Golden 1 Center announced a first-of-its-kind dual application, available soon for free download in the App Store and Google Play. 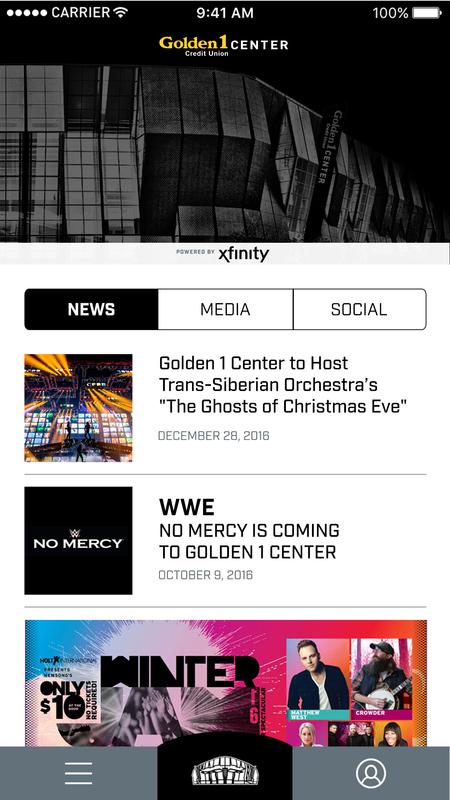 The app is a new platform to experience the technologically enhanced features in Golden 1 Center, and to provide fans with a channel to receive team updates and information. This original approach to a multifaceted app was created in partnership with digital technology provider Built.io and designed by Webby Award-winning digital creative agency M&C Saatchi LA. The new Kings app, powered by Xfinity, features focus on enhancing the guest experience by providing fans with unmatched customer service and access to real-time information, right at their fingertips. When guests utilize the app, their hyper-personalized arena experience will feature on-demand information regarding every aspect connected to their visit, including information about transportation and parking, arena line queuing, and access to advanced game metrics, exclusive video angles and more. The app will also feature an advanced gaming platform for fans to make predictions and compete against one another in real-time. Behind the scenes, Built.io’s advanced digital platform provides the Kings with the ability to add new features and evolve with the demands of Golden 1 Center and the fans. The app’s backend runs 1,500 automations per game across 10 unique application program interfaces, ranging from the NBA to Urban Airship to PubNub. This synchronizes a real-time experience with up-to-the-moment scores, play-by-play info, shot-chart details, as well as team and player stats and more. All told, the combination of products is a backbone that accommodates an incredible 30-plus integrations. The seamless experience begins when fans prepare to come to a game or an event. Kings Season Ticket Members can easily view and manage their tickets in the app through a Ticketmaster integration. Fans can also browse the Kings and Golden 1 Center schedules to purchase tickets for single games, concerts or shows at the touch of a button. Single game and event ticket holders can also enjoy a seamless experience of viewing and managing their tickets, making entry into the arena quick and easy. As fans head downtown, they can access real-time information about multiple transit and parking options. UBER integration, a direct link to purchase parking in advance, as well as select public transportation information will all help fans plan their route downtown. Once in the arena, high-quality maps will help fans navigate the concourse and get right to their seat. Real-time information will let fans know if the line is long at their favorite local eats or if there is a wait for a nearby restroom. From their seat, fans will be able to order delivery from the arena’s NBA-leading farm-to-court menu, featuring local favorites alongside arena classics. Seat and experience upgrades will also be available for purchase from the app, as well as team merchandise and memorabilia. Kings fans in the arena will be able to take advantage of special features only available in Golden 1 Center. During games, multi-angle replays and live streams will give guests in the arena the opportunity to catch the action from multiple perspectives. Fans will also have instant access to a new way of visualizing a wide range of team and player data as the game progresses. In a professional sports team first, KAI – Kings Artificial Intelligence, the team’s Facebook Messenger bot — will be featured in-app to answer questions about the team and venue. The new Kings app will also feature an integration from LAVA, a cloud-based customer engagement platform that utilizes machine learning to engage and fans with hyper-personalized experiences. By using the app and coming to games, fans will be eligible for these tailored offers and rewards based on their activity within the app and at the arena. For concerts and shows, guests can switch the app to Golden 1 Center mode at the press of a button. Here app users can find set lists in anticipation of an upcoming concert, track show announcements and get up-to-date event details, in addition to features designed to enhance the arena experience.